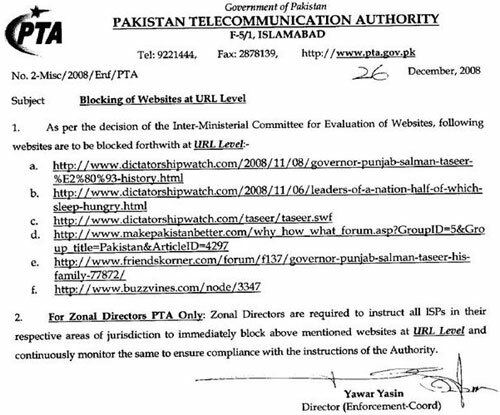 The URL Level block directive by the PTA was in response to the decision taken by the Inter-Ministerial Committee whose charter is to monitor and block anti-Pakistan, blasphemous, and pornographic web sites. The specfic URL's under question carry a bunch of pictures of Mr. Salman Taseer, the Governor of Punjab. These pictures had been making rounds on various email lists across Pakistan some months back ridiculing the lavish parties thrown by the Governor Taseer at the Governor House while his people have been starving on the streets. Three of the six webpages on the list issued by the PTA, however, are from dictatorshipwatch.com, a website set up after November 3, 2007, when then-President Gen (Retd) Pervez Musharraf implemented a state of emergency in the country. One webpage is from makepakistanbetter.com, a social and political discussion forum. The fifth page is from friendskorner.com, a general discussion forum, while the sixth webpage is a node from buzzvines.com. Most of the blocked webpages contained articles which claimed to provide information about Punjab Governor Salman Taseer’s “history”; others had pictures of members of Taseer’s family at lavish parties thrown recently at the Punjab Governor House. It’s a brilliant step by the government since the blogers somehow started publishing anything to attract traffic to their respected blogs. In this case they published some private pictures of Governor’s family who has nothing to do with politics and public lives – the pictures invaded the family’s privacy. The blogs which published Governor’s pictures were not banned which is very fair indeed. Its too late. Good work bloggers, who ever published, atleast people came to know the real picture of corrupt person like Mr.Salman taseer, the person who is not a good Muslim, how can he be honest, sincere, true to his people he is governing. Why all people hide the REAL TRUTH of such corrupt people bureaucrates who mess the Country instead of developing, Mr. Zardari appointed him because both people minds match i-e CORRUPT. In a Democratic Country, such things dont happen, every thing should be open to the citizens of the Country.